Tianwei Zhang, Stéphane Caron and Yoshihiko Nakamura. International Journal of Humanoid Robotics. Submitted August 2016. Published March 2017. Stair climbing is still a challenging task for humanoid robots, especially in unknown environments. In this paper, we address this problem from perception to execution. Our first contribution is a real-time plane segment estimation method using unorganized lidar data without prior models of the staircase. 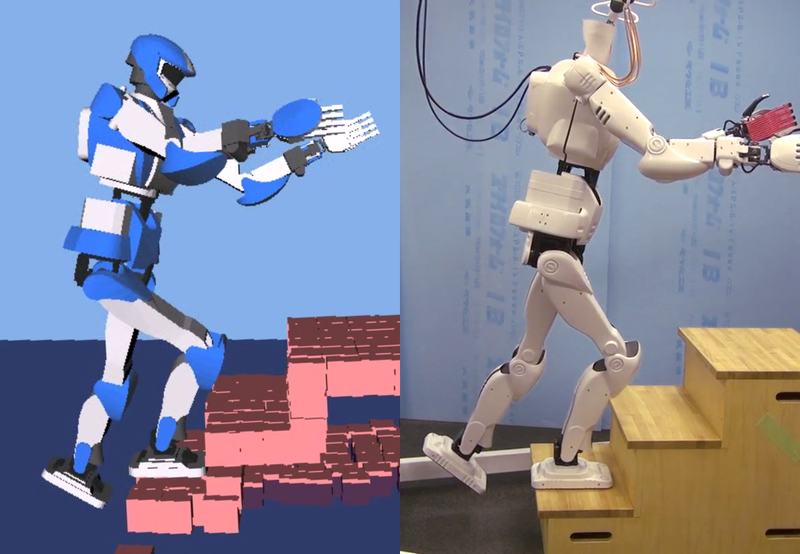 We then integrate this solution with humanoid motion planning. Our second contribution is a stair-climbing motion generator where estimated plane segments are used to compute footholds and stability polygons. We evaluate our method on various staircases. We also demonstrate the feasibility of the generated trajectories in a real-life experiment with the humanoid robot HRP-4.